Introducing Steem Metrics, graphical metrics explorer for the Steem Blockchain. 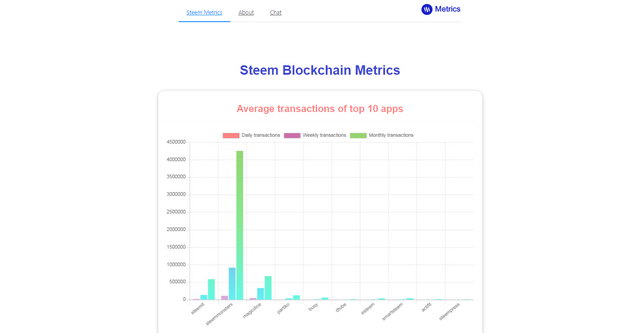 Steem Metrics is an web app that shows various metrics from the Steem Blockchain with charts. We hope that the use of charts would make it easier for users to visualize insights of the Steem Blockchain. Data is sourced from the Steem Apps API. Steem Apps is by @theRealWolf. More charts and insights would come in the next updates. What is coming in v2? This project is being developed as a prerendered SPA which is being hosted on Netlify. Data is gathered from API endpoints. We hope this model would help keep the reduce the costs of running the project, hence help to keep up. Steem Metrics is another open source project from the Steem Institute, if your are interested in inspecting the code or contributing to it, visit the repo on Github. You can also join our Discord server at: https://discord.gg/xeSnGc8, if you are interested in a role or any of our projects. Great charts! Have you thought about to get your charts into steemapps as well? Would be great to see that coming. Good charts are missing on steemapps and I think @therealwolf would be very happy with some help on his site. Hello @dzivenu! This is a friendly reminder that you have 3000 Partiko Points unclaimed in your Partiko account!